This curry is healthy and comes with deliciousness of curry different beans, cooked in creamy tangy tomato sauce along with whole bunch of spices. 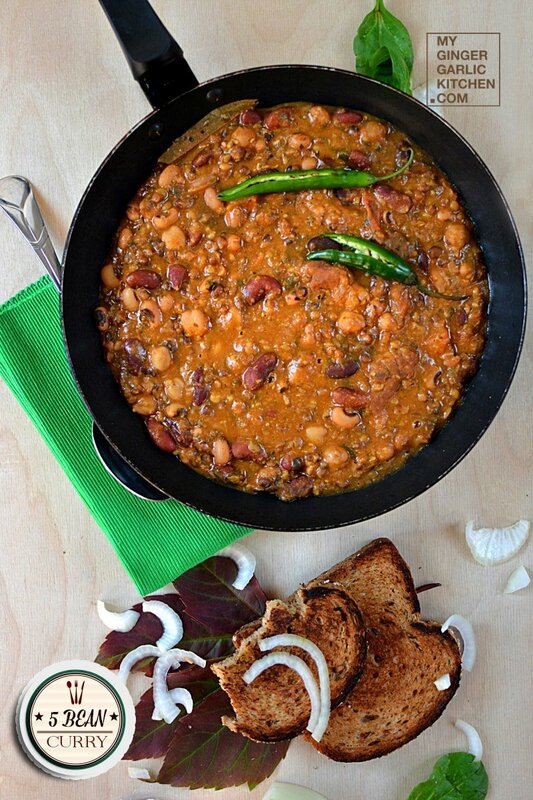 This 5 bean curry is an Indian style curry, which is the blend of 5 protein-rich beans. 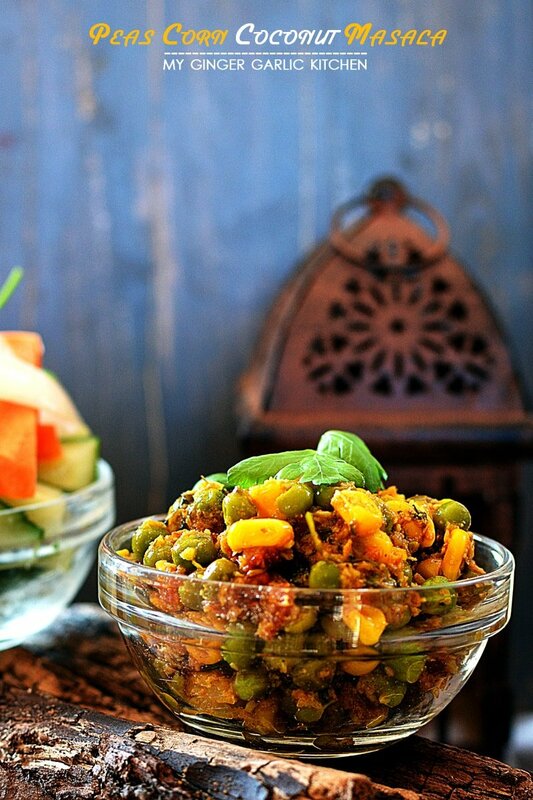 This curry has a tomato based spicy masala which blends perfectly well with all different textured beans. 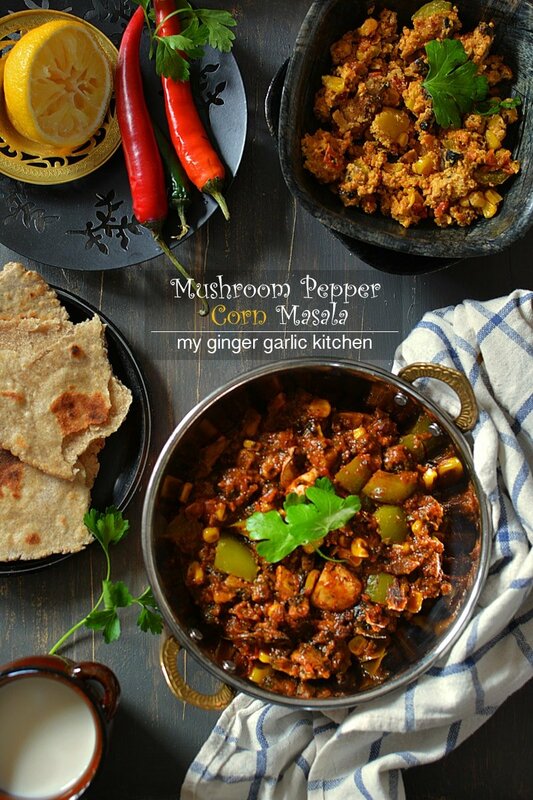 My love for all type of beans forced me to I create this easy, hearty, gluten-free, vegetarian curry which tastes scrumptious. 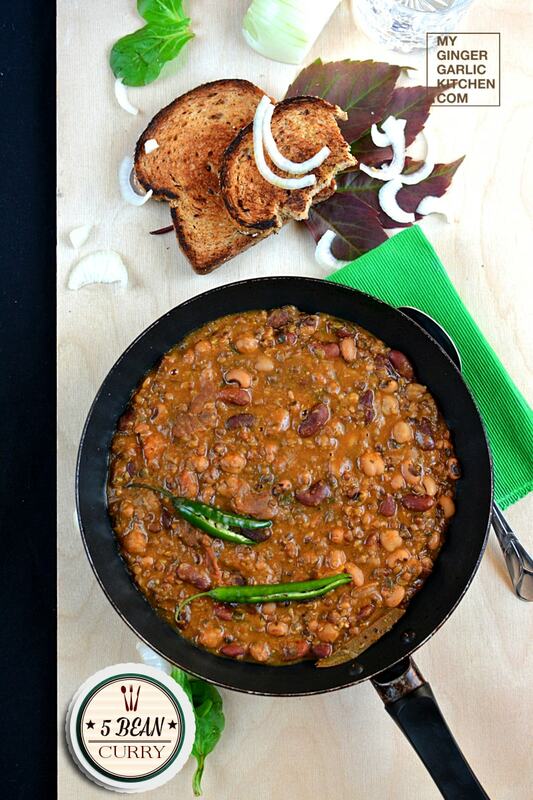 This awesomely divine 5 bean curry makes a great satisfying meal when combined with some plain rice or paratha. This healthy and comes with the deliciousness of different beans, cooked in creamy tangy tomato sauce along with the whole bunch of spices. It is definitely protein rich curry is a good alternative with a little twist to regular bean curry whenever you feel like having one. 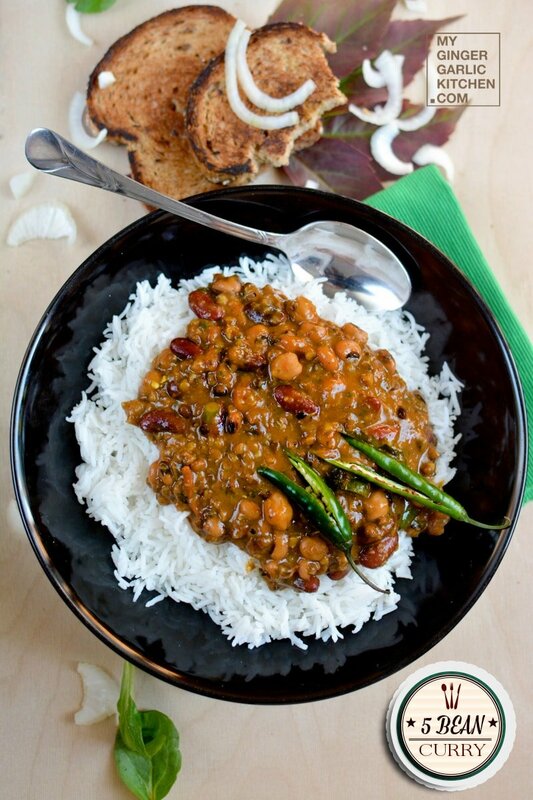 5 bean curry can be eaten for lunch/dinner accompanied by rice or naan. Wash all the beans and add 3.5 cups water to it. Add beans to a pressure cooker along with salt, bay leaf, black cardamom, cinnamon stick and 3.5 cups of water.Cover the lid, and pressure cook for 6-8 whistles. Let it cook on on low heat for about 10 minutes. When the cooker is cooled off, open the lid. Heat oil & butter in a pan. Add cumin seeds to it. When they start to splutter, add onion paste and ginger-garlic paste. Saute for about 5 minutes or till it turns golden brown. 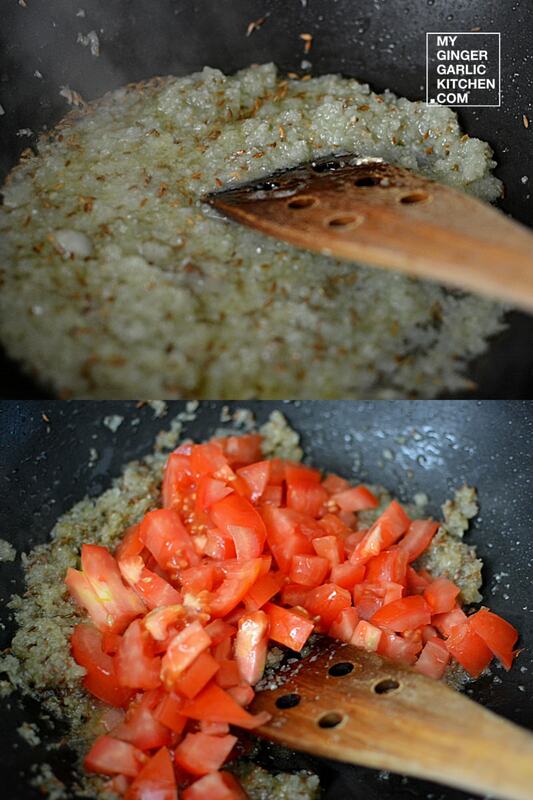 Add chopped tomatoes, and cook for 5 minutes. 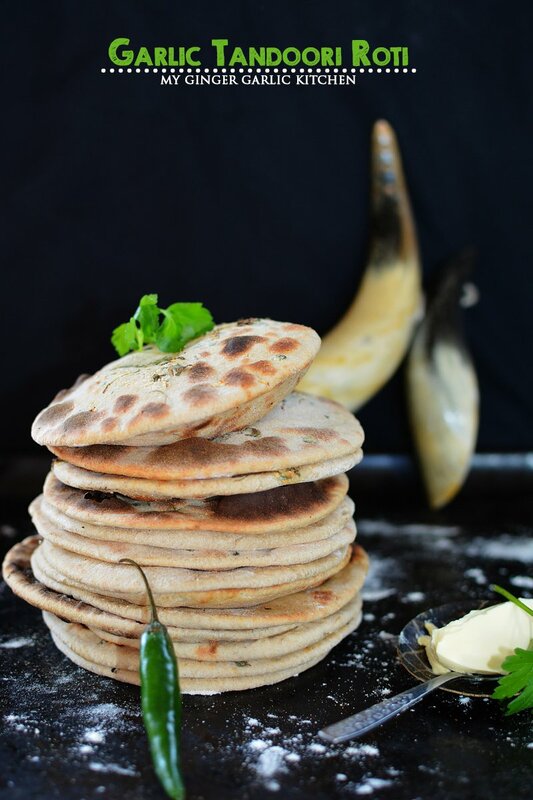 Now Add cream cheese spread and cook for 3-4 minutes.Add chili powder, coriander powder, cumin powder, turmeric powder and garam masala powder along with ¼ cup of water.Let the spices cook with water for few minutes. 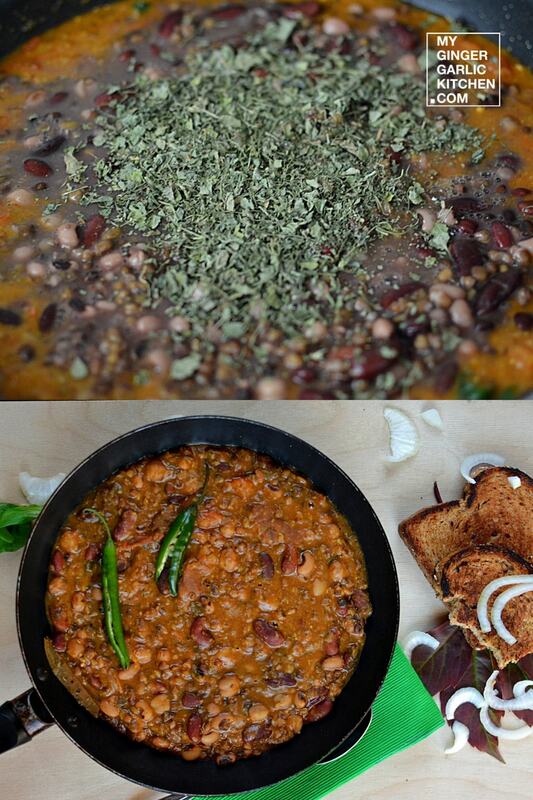 Now add kasuri methi, sugar, cooked beans, and mix well. Cook on medium heat for 15-20 minutes till gravy thickens.Add more water if needed.Remove from heat, and serve hot with steamed rice or naan. 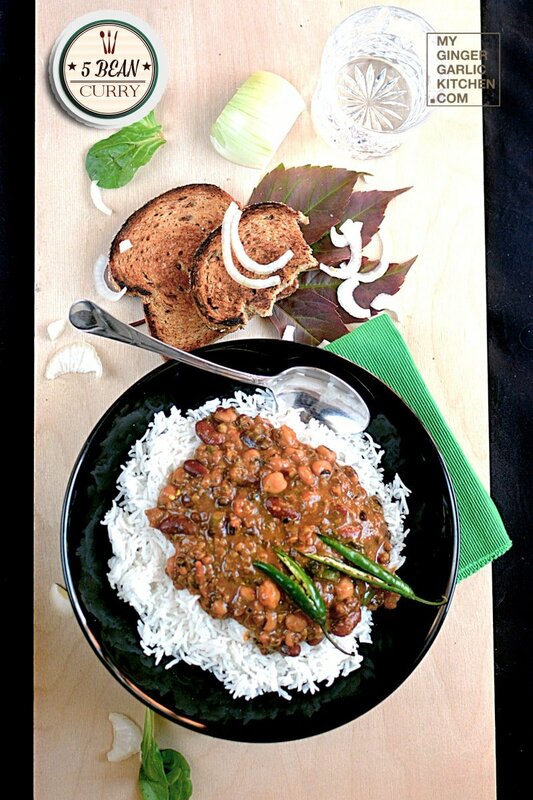 5 bean curry is an Indian curry, which is the blend of 5 protein-rich beans. This curry is healthy and comes with the deliciousness of different beans, cooked in creamy tangy tomato sauce along with the whole bunch of spices. 1. Combine all the beans, rinse well and add 3.5 cups water to it. 2. 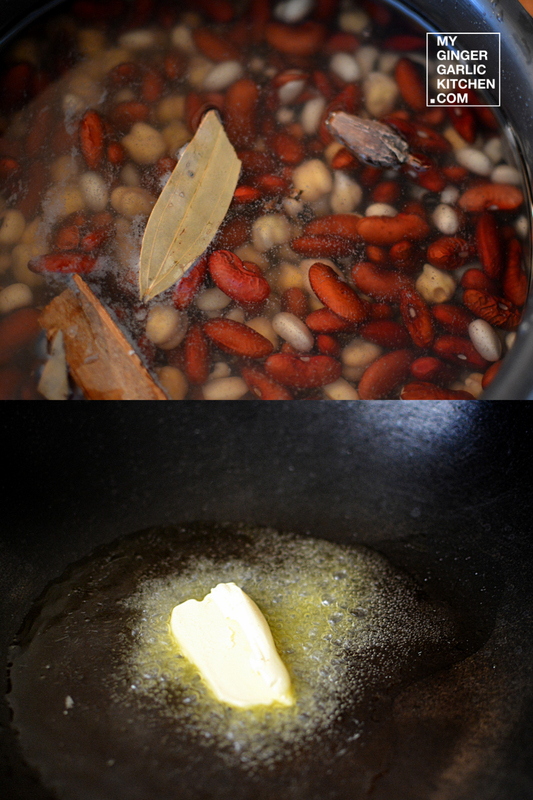 Add beans to a pressure cooker along with salt, bay leaf, black cardamom, cinnamon stick and 3.5 cups of water. 3. Cover the lid, and pressure cook for 6-8 whistles. 4. Let it cook on on low heat for about 10 minutes. 5. When the cooker is cooled off, open the lid. 6. Heat oil & butter in a pan. 7. Add cumin seeds to it. 8. When they start to splutter, add onion paste and ginger-garlic paste. 9. Saute for about 5 minutes or till it turns golden brown. 10. Add chopped tomatoes, and cook for 5 minutes. 11. Now Add cream cheese spread and cook for 3-4 minutes. 12. 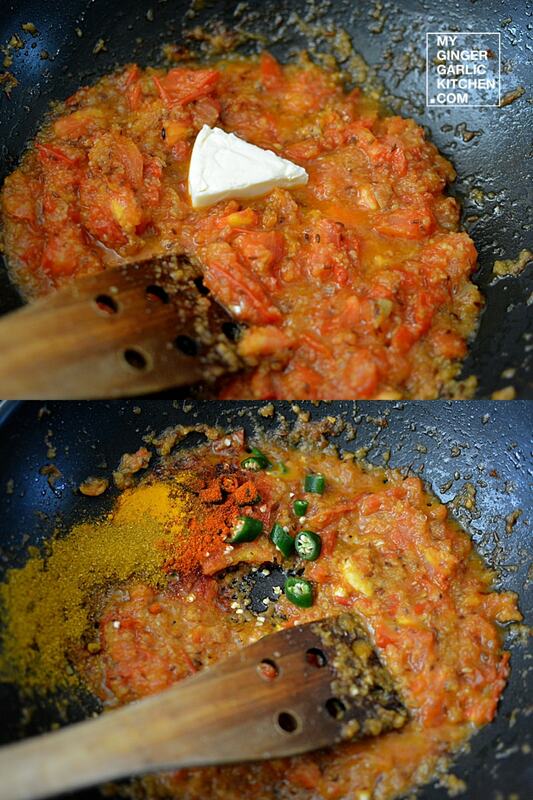 Add chili powder, coriander powder, cumin powder, turmeric powder and garam masala powder along with ¼ cup of water. 13. Let the spices cook with water for few minutes. 14. Now add kasuri methi, sugar, cooked beans, and mix well. 15. Cook on medium heat for 15-20 minutes till gravy thickens. 16. Add more water if needed. 17. 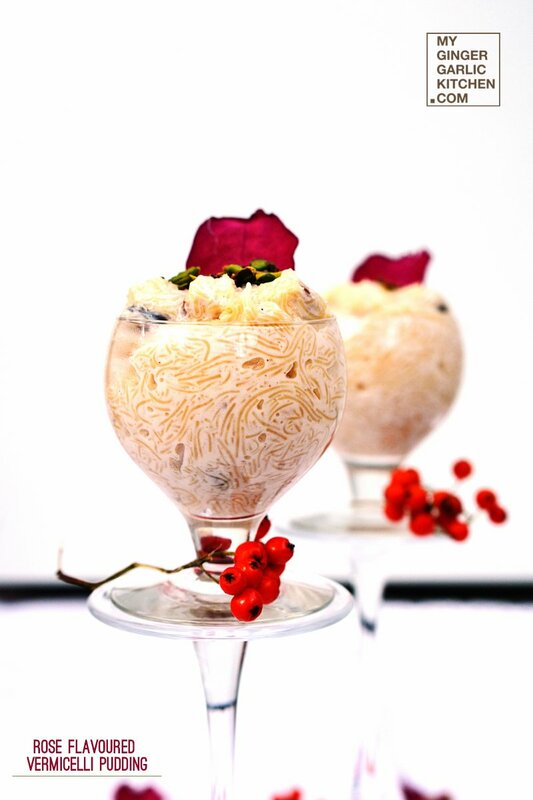 Remove from heat, and serve hot with steamed rice or naan.